According to Geoff Neupert, the author of Six Pack Abs 365, 80% of the formula to have your own six pack abs is nutrition. 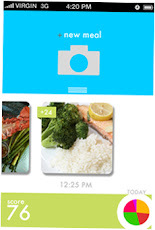 If your like me who find it true then it would be helpful to track your meals with an app. Thryve is a food tracking app that do just that. But instead of logging how many calories your meal has, it tracks your food log a little different. First it let you take a photo of your food, then enter the ingredients, and lastly indicate how much of each item you ate. After an hour or two, the app will popup and ask you how the meal made you feel. The main point of this app is to remind you of the good and bad foods you had in the past and hopefully eat based on your experience. If your tired playing by the numbers then give this app a try.